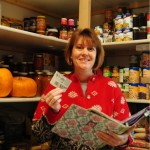 Participating in a month long Pantry Challenge really forces a person to be creative. These last two weeks of our Pantry Challenge have pushed me to think outside of the box and break any sort of habit I had fallen into with food and meals. I’m finding creativity and newness as a good thing! We enjoy sandwiches in our house. The boys like making them for snacks and of course they are quick and easy for lunches. But lunch meat doesn’t last long and it is expensive. Last year, I found a wonderful way to make our own roast beef, so we’ve been making that this month. Wishing for a little variety in lunch meat choices, it dawned on me that the big ol’ ham which is consuming lots of prime real estate in my freezer was the solution. Seriously, don’t ask me why I never thought about it before! We have a meat slicer which my husband received as a Christmas gift and it would turn that monstrous hunk of meat into delectable thin slices of deli-style ham. So, because of the Pantry Challenge I discovered another way to save money on sandwich meat. Plus, I’m pretty sure ham from our own pork will taste so much better! But I pushed myself to think beyond what seemed like the easy solution. What could I use instead? Well, we have kale in the greenhouse! Kale, white beans, garlic, salt, and pepper all drizzled with olive oil and tossed is an absolutely yummy side dish… or main dish when you eat the whole bowl. (A-hem, I’ve never done that, I swear!) Again, that idea would’ve never come into my radar if I wasn’t challenging myself to use what I have at home! For Valentine’s Day, I want to make a special dessert for my family. Pots de crème came to mind, but I would need to buy cream. Hmm, what could I do? Well, I searched my Divine Dessert board on Pinterst and found the perfect answer: Apple Enchiladas! We have quarts of homegrown apples in the freezer and I stocked up this summer on flour tortillas – using coupons and sales I got them for 75 cents a package. It’s a perfect dessert to show my family how much I love them and there’s no need to run to the store! I’ve had a few things on my shelves for a good, long while and they have become such fixtures in my pantry, I don’t even notice them anymore. Isn’t that bad?! Those items are packages of bean/alfalfa seeds for sprouting and a package of San Francisco Sourdough starter. So, now I have sprouts sprouting on my counter ready to enter those yummy ham sandwiches. And I have been busy keeping up with feeding my sourdough starter everyday…did I mention the EVERYDAY part?! But we have been having some wonderful bread, pancakes, and rolls so I can’t complain too much. Again, thank you Pantry Challenge for opening the doors to new and exciting food! Speaking of that, I must mention that not every discovery is welcomed. I had some organic, stuffed grape leaves on my pantry shelf. Thinking it would be fun to have a “Mediterranean” meal, I served the stuffed grape leaves with couscous, lamb meat balls, and minted peas. I thought I was pretty clever! But one look at the stuffed grape leaves and my boys looked at me like I was crazy. They tried one little bite and even my oldest son, who likes almost every food, was gagging. Yeah, and they weren’t fans of the couscous either. So, my creativity kinda bombed this time, although Jon and I enjoyed it all and I used up things on my pantry shelf! This week is my baby’s eighth birthday and boy, this kid likes to party! We have a friends party, a family party, and, of course, treats being taken to school. But I’ll be pulling out a coupon for the Oreos and using a gift card I have for the grocery store. Pulling off special occasions with flare and frugality is so satisfying and fun for me! So as you can see, forcing myself to think outside of the box, be creative, and use outside resources like Pinterest helps keep me on track during our month-long Pantry Challenge. We have discovered some great new foods (some not-so-great, too!) plus we’ve learned some new ways of using foods! If you are joining us on the Pantry Challenge, tell us how it is going and what new things you have discovered!